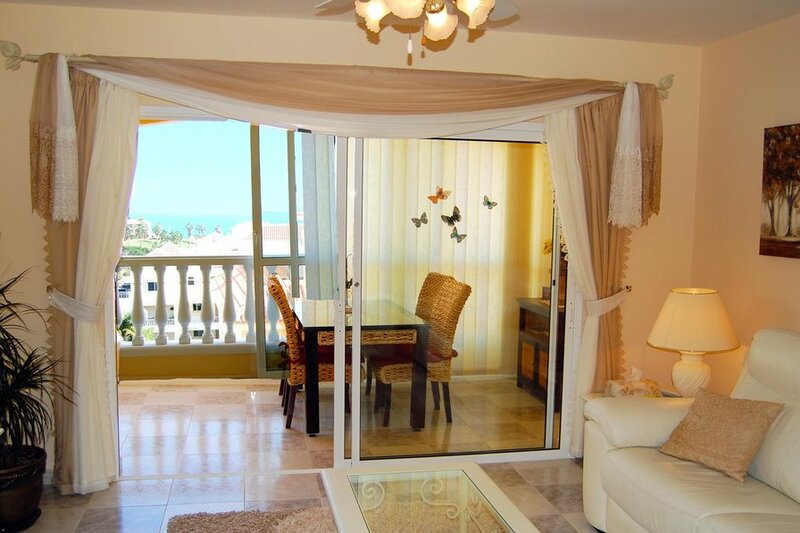 A beautifully furnished 2 bed, 2 bath apartment to rent in Ocean Golf and Country Club, Golf Del Sur, Tenerife with lovely sea and golf course views. The prestigious Ocean Golf and Country Club is seen as one of Golf Del Sur's premier complexes. Offering a location between the sea, the mountain and the lush green golf course, all within well landscaped gardens and swimming pool, this is a very high quality complex. This lovely first floor, two bed, two bath apartment is amongst the best on the complex. Immaculately kept and in pristine condition. Air conditioning is supplied in the bedrooms. The apartment has a safe. The apartment is built to a spacious open plan design. The main living space comprises a large through-room, with a living area which opens out on to the balcony with views over the pools, the golf course, and down to the sea. The apartment has been furnished to a high standard, and has satelite TV with English TV channels. The master bedroom has a king-size bed, fully fitted wardrobes and ensuite. The 2nd bedroom also has a king-size bed and fitted wardrobes. There is a separate 2nd bathroom to service the 2nd bedroom. The open plan design kitchen has a ceramic hob with hood over, an oven and microwave, a fridge and a freezer. A full size washing machine is provided within the kitchen cupboard, as is an iron and ironing board. The spacious balcony offers lovely views over the golf course to the sea. It is very comfortably furnished and ideal for relaxing whilst enjoying the views. This is a very high quality apartment offering a high degree of comfort. This block of Ocean Golf and Country Club has two pools, one of which is for children. The main pool is heated. Every amenity is provided within walking distance. At the front of the complex there is a supermarket, a lovely wine bar / Tapas Bar, and some other various restaurants and bars. . All guests must try the gorgeous Tapas bar called 'Dabdas' which has built up quite a reputation as a high quality establishment. The sea is a 5-10 minute walk away downhill and on the sea front you will a gorgeous sea front promenade where there are some really nice Spanish restaurants and bars. A pleasant 10 minute walk will bring you to the picturesque resort centre which is based around a main square. Here you will find more good quality bars, restaurants (many with evening entertainment), boutiques, banks and a doctors. A 10 minute walk in the other direction takes you to the marina. Here there are many sea front bars, restaurants and shops. The nearby small fishing village of Los Abrigos, also has some lovely Spanish restaurants on the harbour. The Pool at the complex is heated!